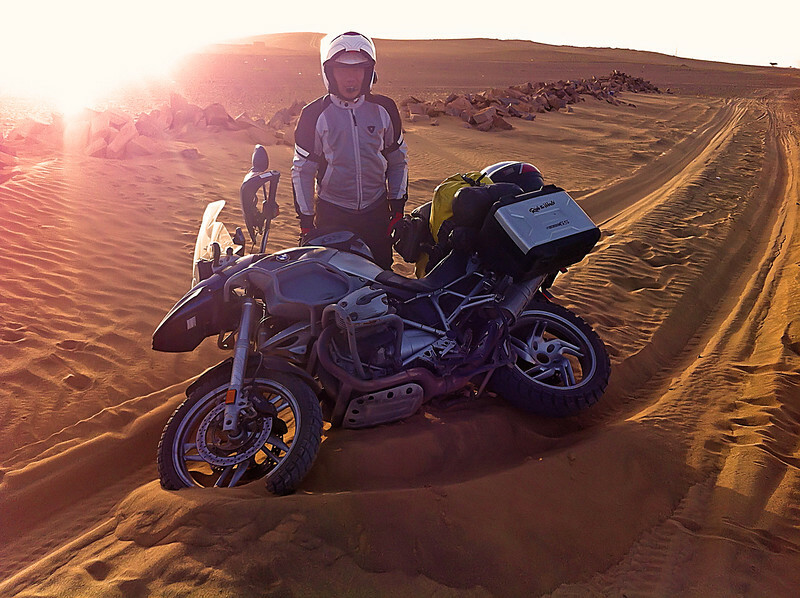 Feb 09 2015: Sahara Desert!!! We are continuing our trek southwards. 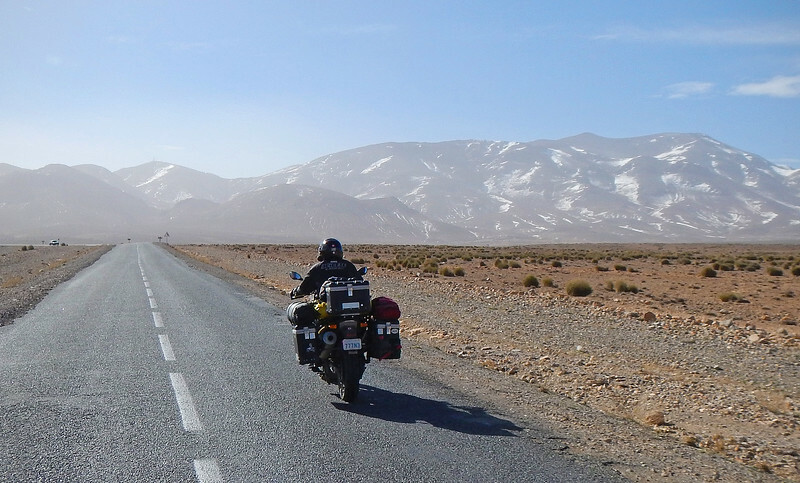 Now that we've reached the other side of the Middle Atlas Mountains, we are seeing a much different kind of geography than Northern Morocco. The satellite map above illustrates this point quite well. 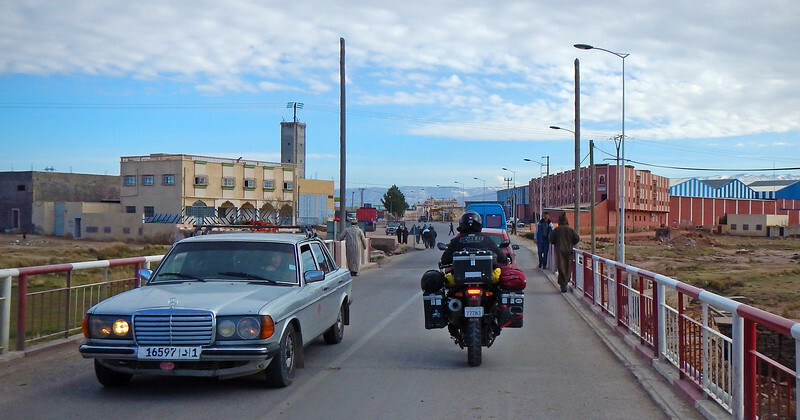 These older Mercedes were quite common on the roads in Morocco. If they were cream-coloured, they were almost always taxis. It's a brilliant day for riding, the clouds have all but disappeared by the late morning. 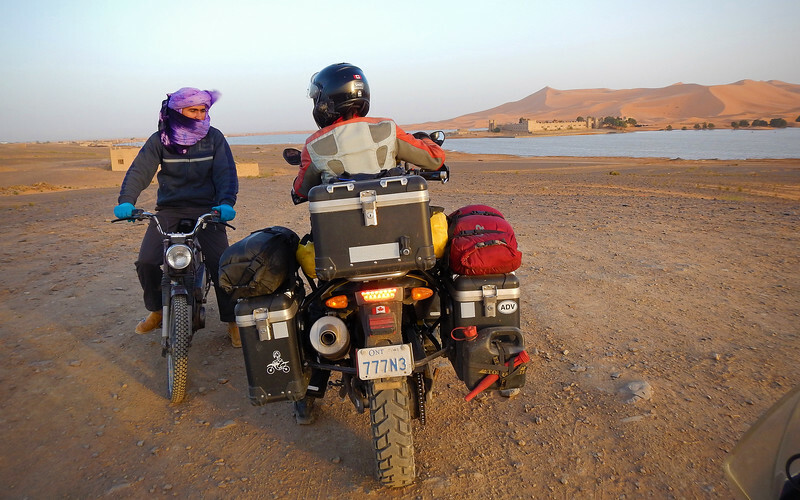 However the temperatures are still quite cold and we keep all our layers on for the ride. Two of Morocco's biggest T-Swizzle fans in one place? As we were stopped, this little guy came running towards us and started talking to me in Arabic or Berber (not sure which). We couldn't make out what he was saying, but he was definitely asking for something. I thought it was money, but it turned out he wanted a pen. 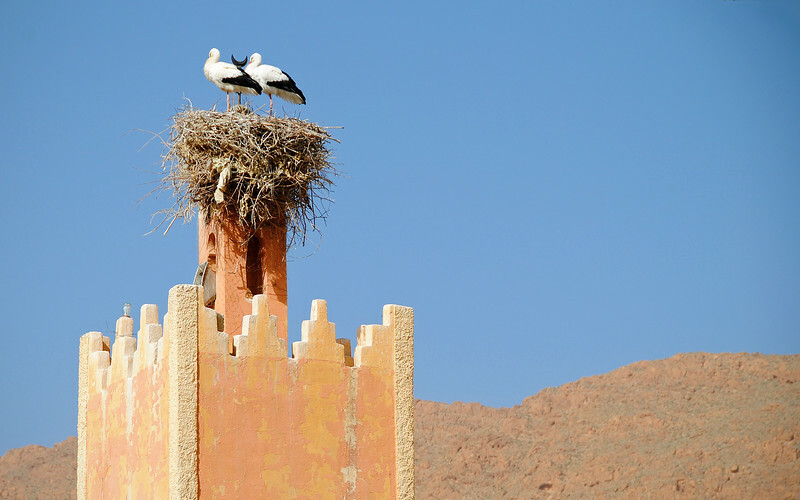 Did you know that the White Stork is the national bird of Morocco? You can find their nests on any tall chimney, building, tree or pole. Unlike in the western world, these nests are very welcome because the birds are a symbol of good luck and fortune. They say that the stork at rest is reminiscent of a man in prayer, and there's a Berber belief that storks are transformed human beings. We're told that disturbing a stork will get you three-months in prison. Don't mess with these jailbirds! Not real Moroccans. Damn hippies. We overheard these guys, they were a bunch of granolas from Spain dressed in designer djellabas and striking meditational yoga poses on the wall overlooking the gorge. Then after about 15 minutes of Faux-Ga, they all hopped into their hippy van with Spanish plates and drove away to the next beatnik spot. 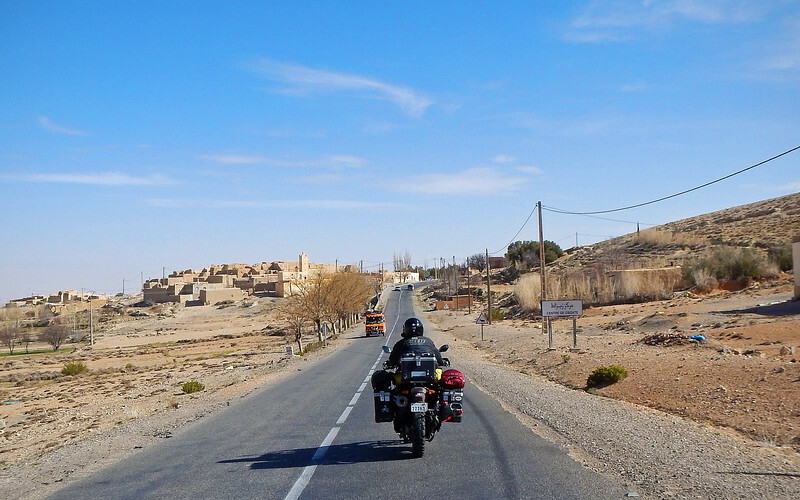 As we were riding down from Northern Morocco, Neda told me that one of her favorite books when she was a little girl was "In Desert and Wilderness" by Polish author, Henryk Sienkiewicz. It's about a pair of children who are taken hostage and are forced to travel through the Sahara Desert. 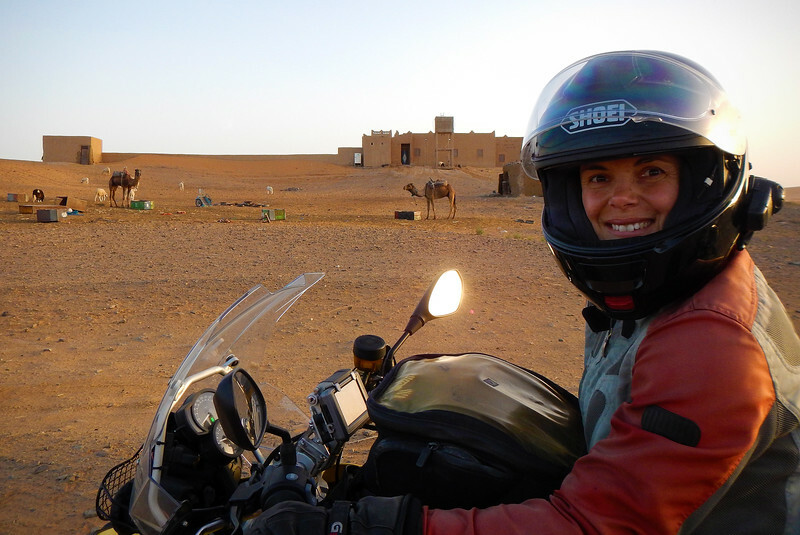 Ever since then, she's always dreamed of visiting Africa, and our first steps in Morocco didn't jive with the imagery she got from the book. 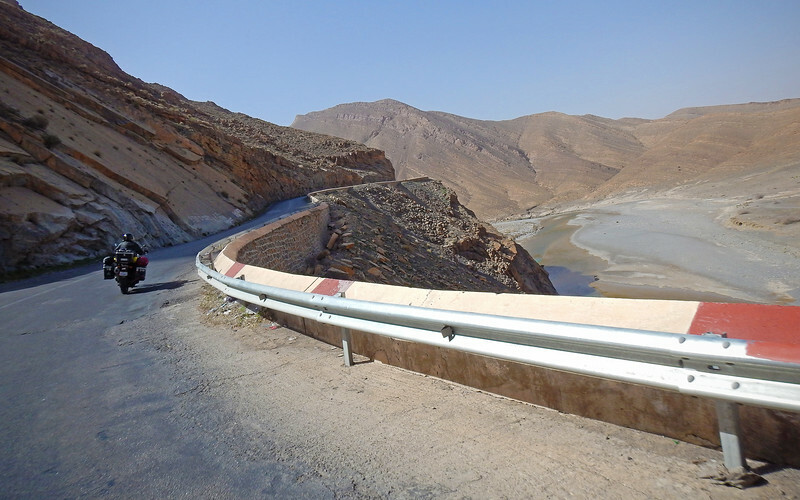 However, south of the Atlas Mountains, everything here is the colour of the desert sand. Even the buildings seem to rise seamlessly up from the same stuff that the ground is made from. 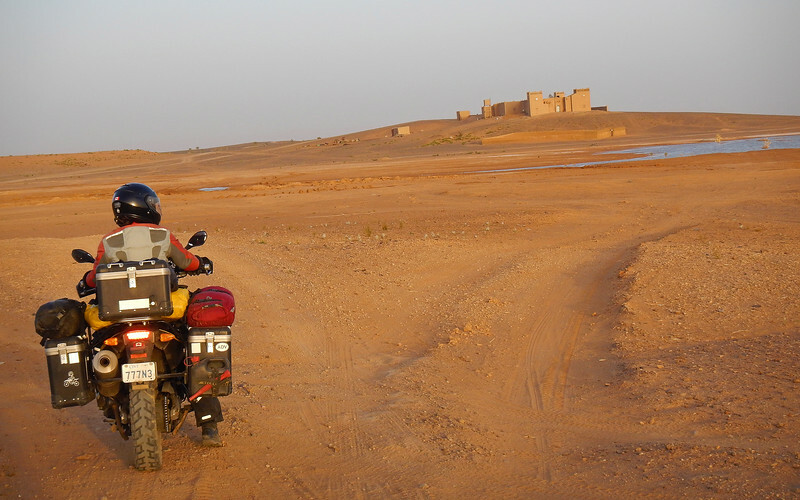 *THIS* is totally the Africa that we had in our heads when we crossed over from Europe! 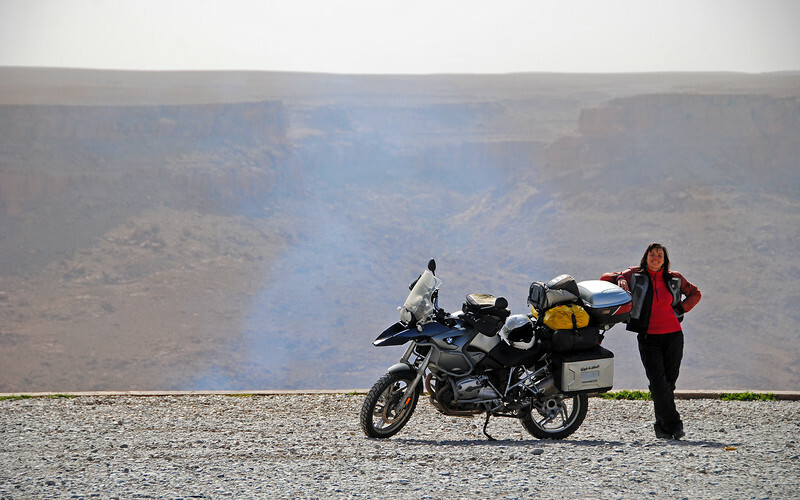 We stopped for lunch in Rissani and had some trouble finding gas. This was not an isolated problem. We often gas up in the late afternoon before stopping and the local pumps always seem to be out of fuel. However, the larger multinational stations like Shell are always in stock, you just have to find one. I'm not sure why this is, whether the local pumps just stock up enough for a single day? When we're riding, I prefer following instead of leading for a couple of reasons. I like taking pictures with Neda riding, it makes for a more interesting photo, and it also stops me from worrying excessively if I can see her all the time instead of checking my mirrors every so often. However, we do take turns leading, and during my stint in the front, I checked my mirrors one time and my heart skipped a beat when I noticed Neda wasn't behind me anymore. I panicked because normally if she's slowing down or stopping she'll radio me to let me know. I frantically tap on the communicator. The beep tells me that we're connected and I call out to her to ask if everything's okay, but all I hear back is silence - she's not responding. This is very concerning. I pull over to the side of the road and wait. 5 seconds. "Hello? Neda? Hello?!" Troubling silence over the communicator. 10 seconds. She should have caught up to me by now. My heart is racing and my mind is thinking all sorts of horrible things. It makes no sense. The road we're on is perfectly straight. 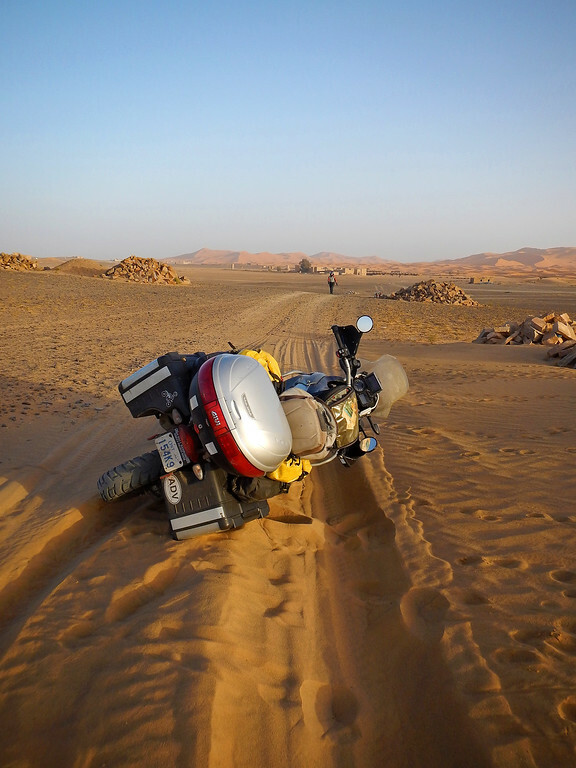 There's a little bit of a cross-wind that moves our bikes around, but we've faced much worse. Was she blown off the road at speed? I quickly make a U-turn and start looking for her. About a km away, I see her parked bike at the side of the road. It's upright and I'm instantly relieved, but she's nowhere to be found. I park behind her and finally notice that she's walking around in the ditch and it looks like she's searching for something. She's still not responding to the radio, so when I get closer to her, she points to the empty spot on her helmet where her communicator should be. Her radio had fallen off somewhere and she was looking for it on the side of the road! My relief that she's okay slowly turns to annoyance that we've lost another piece of our equipment. Everything is falling apart on us! This is so frustrating. 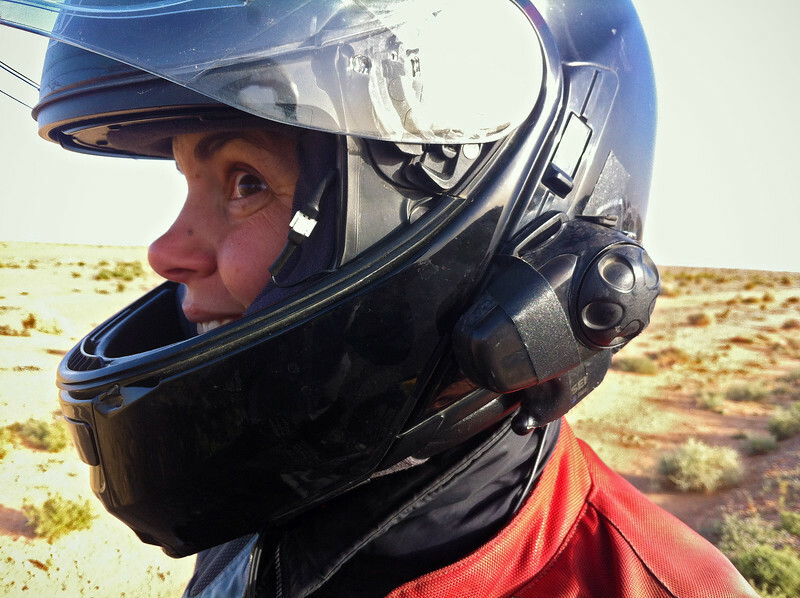 Neda says she saw the communicator in her mirror bounce away from the bike and into the ditch. It's been 15 minutes and we are both walking up and down that same area that she went back to, but the search is proving fruitless. I'm ready to give up, and in my mind I'm already trying to envision what traveling is going to be like without being able to communicate with each other. The comms were such an essential part of our kit. What makes it even more frustrating is that I know Neda's communicator is still working because I'm still connected to it. It's just that it's not connected to a microphone so I can't even play Marco Polo with it. Neda's communicator is lying somewhere on the ground tantalizingly transmitting its quiet background hiss into my earphones. It's driving me crazy!!! Even though we're angry that our stuff is all falling apart, I still have to sing some praise for these Sena communicators: They take a lot of abuse (like bouncing down the highway) and still keep working. The only weak point is the base clamp kit that connect them to the helmets. The pins on my communicator have bent and I have to jiggle them often to make a good connection. The plastic tab that clips Neda's radio to the base has become worn and now the communicator comes loose with just a nudge. So with our comms patched up, we head off the highway into the final stretch for the evening. 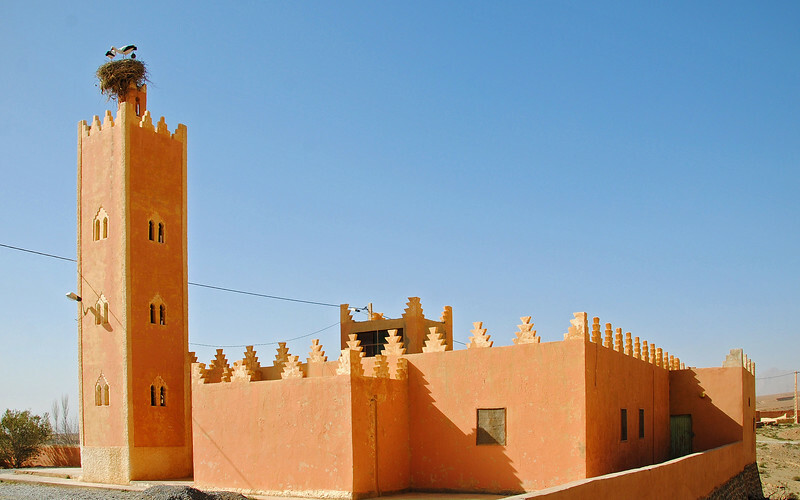 Our stop that we've booked for the night is actually in Erg Chebbi, which is right on the western periphery of the Sahara Desert. 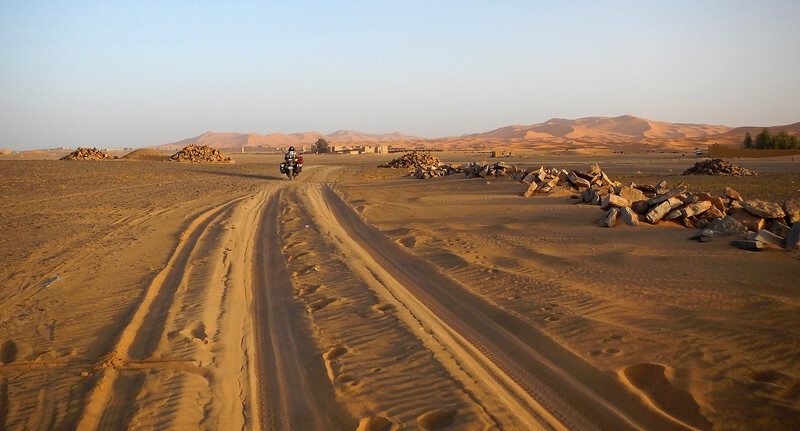 This means that the last 15 kms or so is off-road as we negotiate the poorly marked gravel pistes running parallel to the sand dunes that represent the edge of the Sahara. 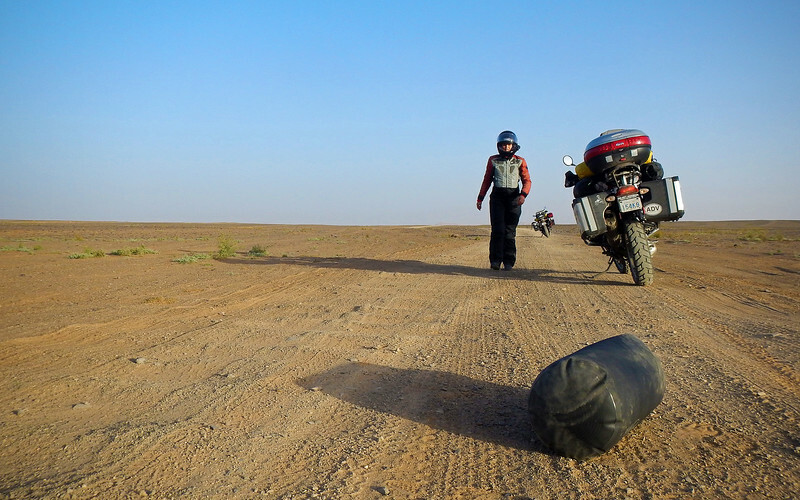 The washboard roads have worked Neda's drybag loose. Thankfully I'm following. I don't want to blame my bike, but the weight is piled so high and so far back that I feel like I'm balancing a bowling ball on top of a broom. 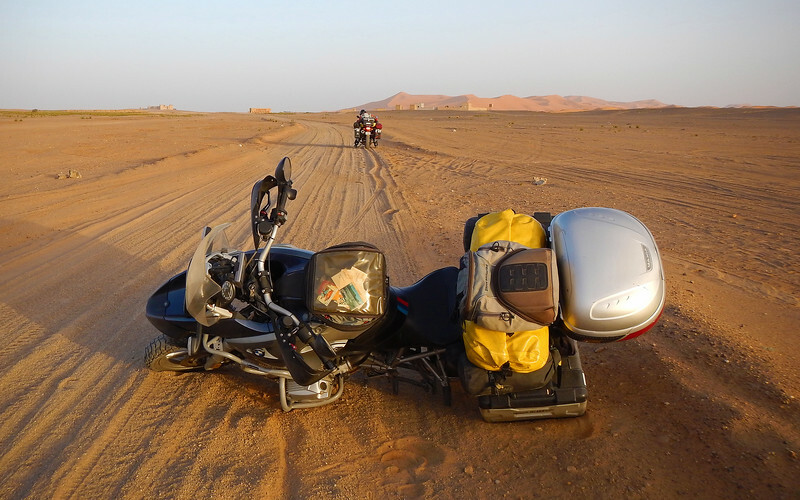 The motorcycle's front wheel weaves worryingly on the deep sand and on one stretch, I can't control the speed wobble and take a tumble onto the soft sand. There's no way I'm getting this baby back upright by myself. I radio Neda, "Can you give me a hand?" Despite all the wobbles and falls, we are having a really good time. The scenery here is phenomenal: dark reddish-orange sands as far as the eye can see, that get deeper in colour (and depth) as the sun falls lower in the sky. 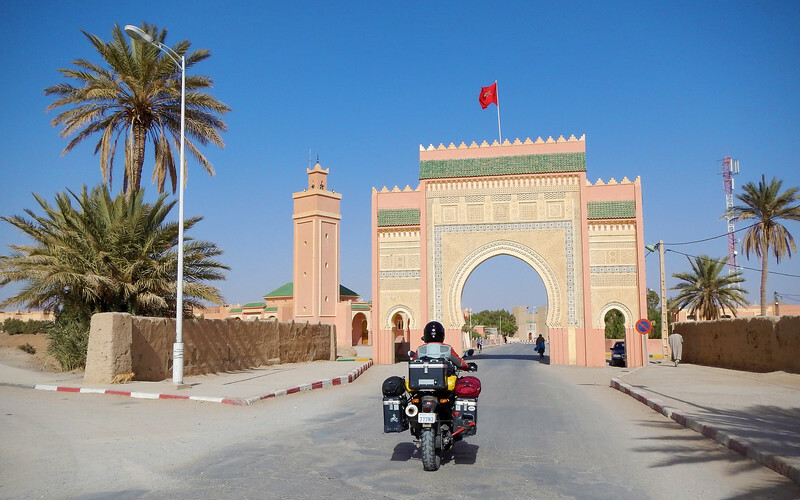 Now this is what we thought Morocco would be like and we're not disappointed one bit! From all the maps that I've looked up on-line, our place should be about 15 kms from the highway. At this point, my odometer reads 20 kms and we're still lost. We don't know which building is the right one, they all look the same and there are no signs whatsoever. I have the GPS co-ordinates, but the pistes don't line up and it looks like we're just circling around where our stop for the evening should be. Neda: "Let's stay in this one. They have camels!" 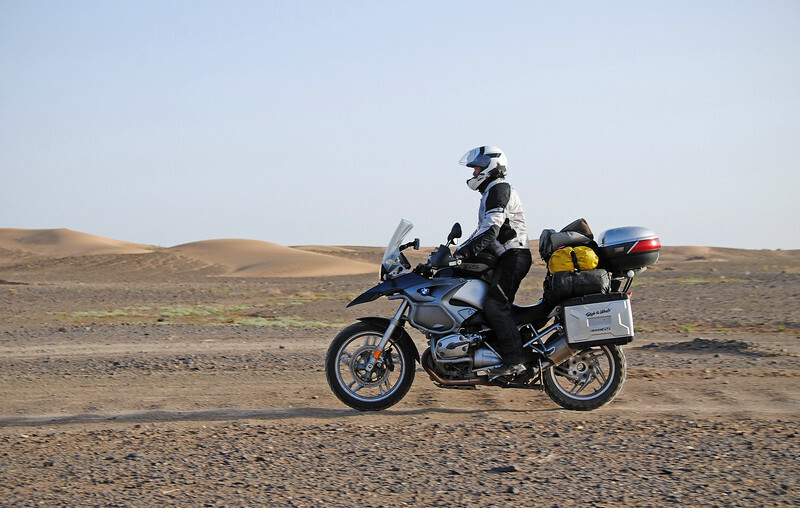 And then out of nowhere, Lawrence of Arabia pulls up on a motorcycle! This guy worked at the place where we are staying. When they are expecting guests, they send search parties out into the area to help guide them in, since it's so confusing out here. We follow him back, and I'm wobbling all over the place, eying his small and nimble, light cycle ahead of me with envy. Our place is right on an oasis...? Oooh, fancy! 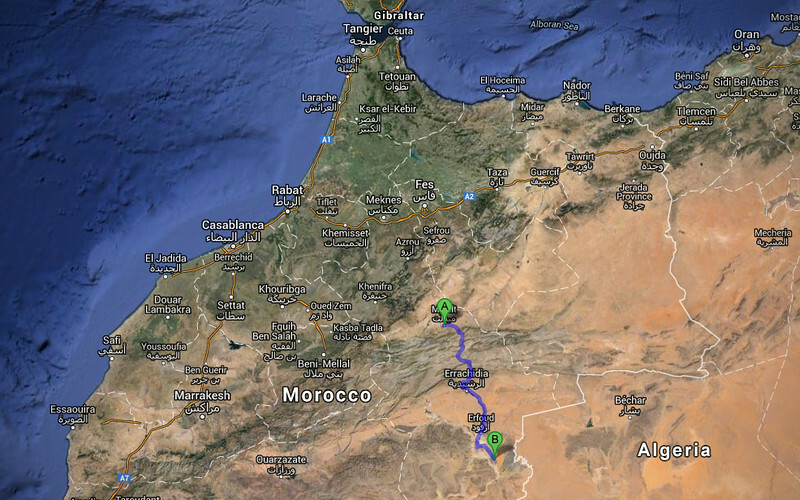 I can't believe we're at the edge of the Sahara Desert. In Africa! On motorcycles! It's all so surreal! We're surrounded by massive sand dunes. I can't wait to go exploring tomorrow!! !